Every year I am left shocked when I find my goal sheet from the previous year. Last year I got as far as scribbling them down (with a few pics) and briefly mentioning them in a blog post. Other than that, I have to shamefully admit that they sat in an unopened file on my desktop. As it is a new year I decided to open it even though I was afraid I would discover a list of unachieved goals. To my greatest joy, this was not quite the case. Those highlighted with green mark the goals that are in process of becoming a reality and those highlighted with yellow mark those which have been achieved exactly. I think my biggest achievement from 2009 is the one which has just happened > I have been given a spot as an Emerging Creative at the Design Indaba 2010. Out of the blue last Friday I got an email informing me that I have been given a stand at the exhibition! I am SO excited about this space even though my to-do-list is running off the page at the moment becuase the event is in 3 weeks time. 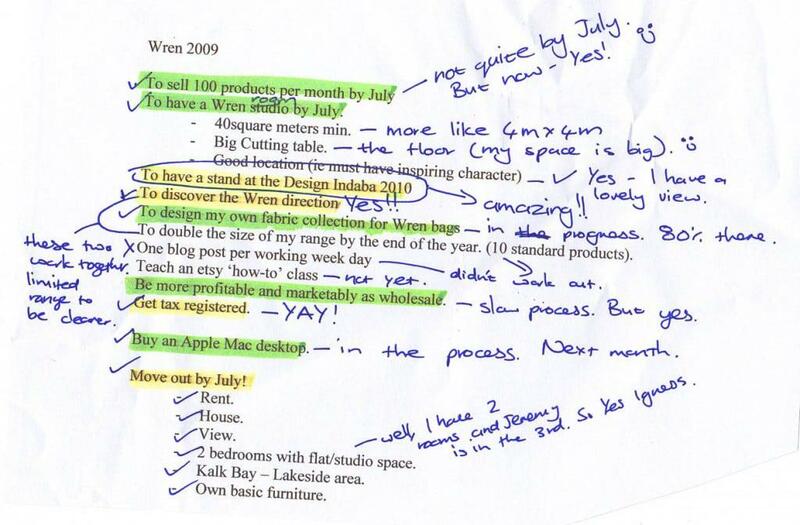 Note to self: Must add ‘make 2010 goal list’ to the to-do-list. This entry was posted in Blog and tagged 2009, 2010, achieving goals, Design Indaba, Design Indaba Exhbition, Emerging Creative, Emerging Creatives, goal sheet. Congrats on the Emerging Creatives thing! I did that a few years ago and it was definitely worth all the hard work. Will see you there – I’m doing a stand with the rest of the Threadcount Collective. Congratulations on being accepted for the exhibition Wendren! Great list and well done!Good luck at the exhibition ,Wendren!